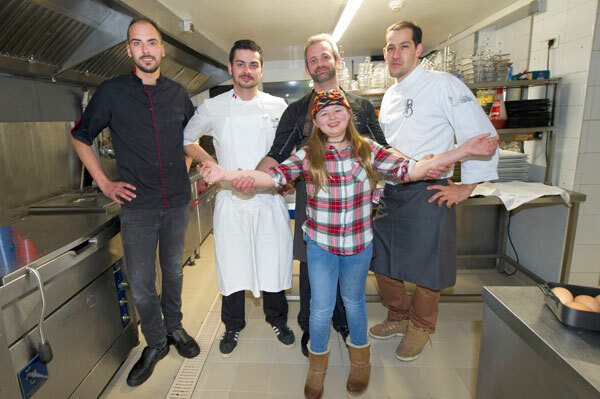 The Chefs au Sommet d’Auron welcomed Geoffrey Poesson, chef of La Badiane in Sainte-Maxime and Philippe Brito, Philippe Brito Pastry in Cannes, for a gourmet dinner at the Régalivou in Saint Étienne de Tinée. 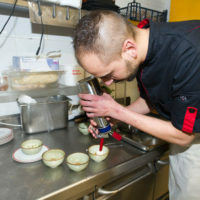 From January 19 to 25, 2019, Les Chefs au Sommet d’Auron – 8th Edition – offered memorable gastronomic experiences at a unique and privileged price. 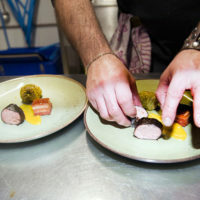 In addition to chefs’ shows cooking at the ice rink, every evening, renowned chefs officiate in the restaurants of the resort of Haute Tinée and offer sumptuous gourmet four hands dinners at the price of 45 per person to tourists and locals in the region. 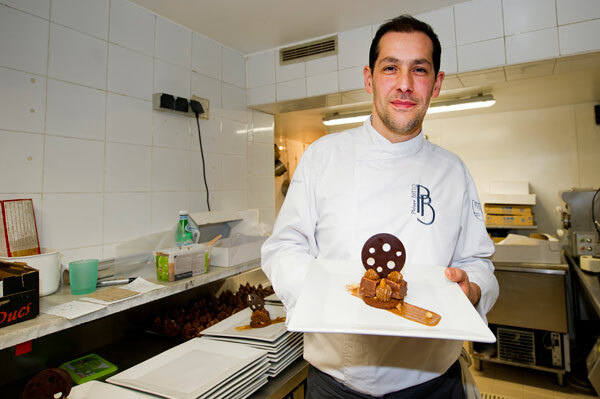 Geoffrey Poesson, chef-owner of La Badiane restaurant in Sainte-Maxime and pastry chef Philippe Brito, Pâtisserie Philippe Brito in Cannes, delighted the gourmets’ taste buds at the restaurant Le Régalivou. For eight years, the Mountain Gastronomy Festival has been bringing together many talented chefs and pastry chefs from the Côte d ‘Azur who share an authentic moment of culinary pleasure and conviviality in the heart of the sumptuous Mercantour mountains. During the Festival, the renowned chefs perform every night real gastronomic feats by performing dinners on “pianos” unknown before. 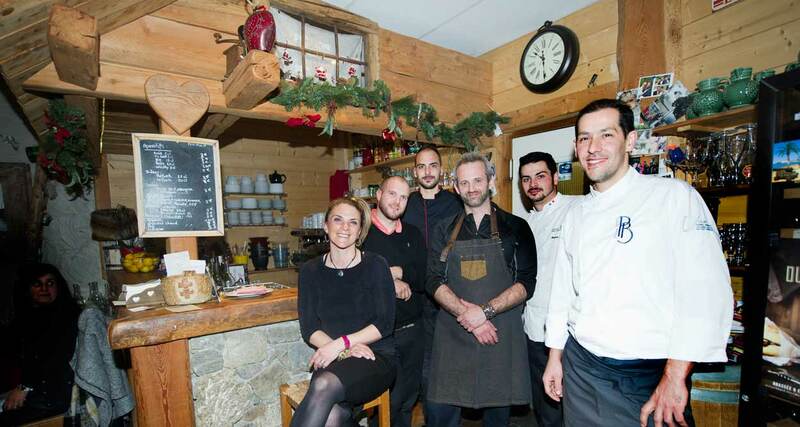 On Sunday, January 20, 2019, chef Geoffrey Poesson and pastry chef Philippe Brito transposed the delicious culinary experiences of La Badiane and Patisserie Philippe Brito in the wooded, warm and mountain setting of the Régalivou in Saint Etienne de Tinée. 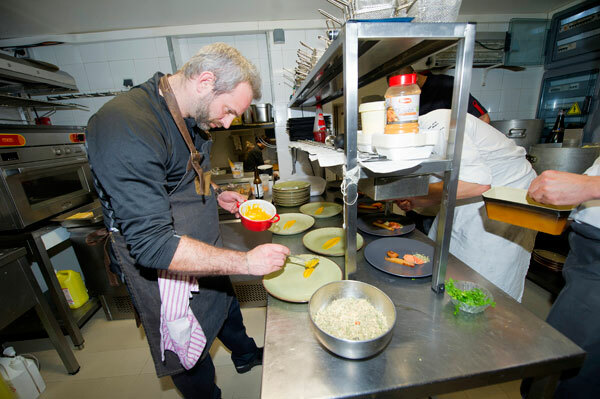 Installed for 11 years in Sainte-Maxime, Geoffrey Poesson is the chef owner of La Badiane restaurant. 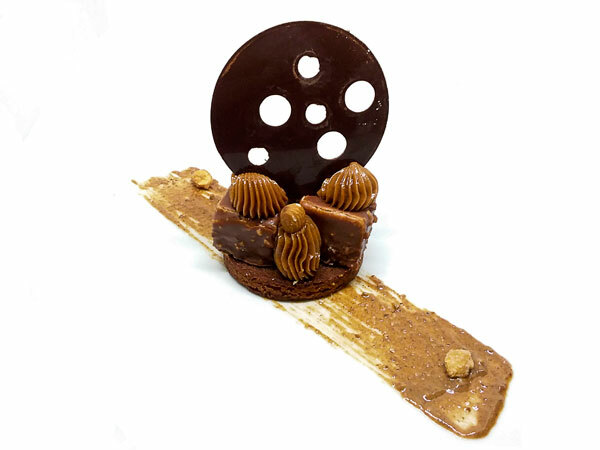 Originally from Meaux, he trained as a pastry chef, then worked as a pastry chef in the United States and Monaco. 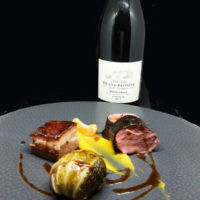 Back in France, he opens his own restaurant on the Cote d’Azur, La Badiane where his creativity sublimates the products cleverly chosen from his chosen terroir in a gastronomy centered around vegetables. Elected “Grand de Demain” by the Gault & Millau guide in 2009, his subtle associations combining culinary techniques and imagination, earned him in 2010 his first Michelin star, which he keep until 2016, and the Trophée de la Cuisine de la Mer then the Culinary Innovation Award in 2017. In addition to his restaurant work, Geoffrey Poesson is a culinary advisor and trainer, and is part of the Escoffier international family of disciples, with his passion for sharing, the transmission knowledge and good humor. Passionate about chocolate, Philippe Brito likes to share his love of the profession, his experience and his singularity as a pastry artist. Before opening the Pâtisserie chocolaterie Philippe Brito in Cannes in March 2011, Philippe took his first steps at the Olcina house in Cannes and perfected his talent in prestigious establishments such as the former Noga Hilton in Cannes, Alain Ducasse’s Bar & Beef and the Monte-Carlo Bay Hotel in Monaco. His cakes and sweets are at the image of his career and personality: traditional in taste and original in their forms and design. Renewing his menu according to the seasons to give the best to his customers, Philippe Brito puts a point of honor to privilege the flavors, the originality in his creations. As for the chocolates of Philippe Brito, they have already distinguished themselves from other chocolates thanks to their cubic appearance which earned him the nickname of “pastry chef with square chocolates”. 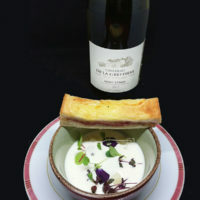 Geoffrey Poesson’s gastronomy draws its roots from the products developed by small producers who are passionate and in love with their terroir. 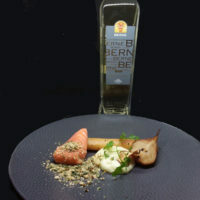 A way to honor the flavors of the season, combining tradition and contemporary spirit, the dishes showcased the noble products of the local terroir, inspired by the Bio and Locavore values ​​advocated by the Chefs au Sommet d’Auron. From the appetizer to the main course, each dish is a discovery: authenticity and quality are at the rendezvous in plates colorful and full of freshness where vegetables and aromatic herbs make up a vitamin basket. 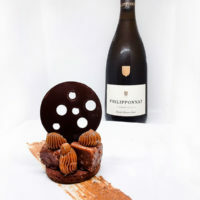 Philippe Brito has composed a virtuoso dessert using several facets of the Praliné to exalt sugar, hazelnuts, vanilla, cocoa. 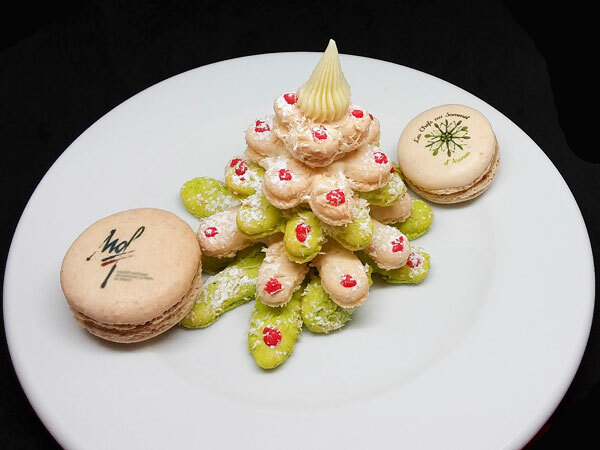 A superb surprise dessert made with coques of macaroons satisfied the most gourmand. 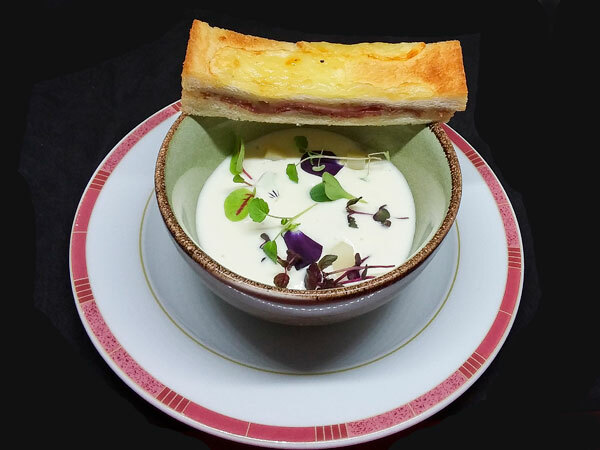 Appetizer: Tomme d’Isola Mousse, Young Sprouts, Finger of Coppa as a Croque-monsieur. The mountain terroir is omnipresent in this taste of Geoffrey Poesson’s talent of who knows that a good cheese goes along so well with good charcuterie! Young shoots and petals bloom this delicate dish, exhaling their fresh flavors. Entrée: Mousseux of Parsnips, Melting Pears, Candied Salsify, Pavé of Trout in Herbs Crust. Winter vegetables accompany the trout dressed in a high in savor crust. 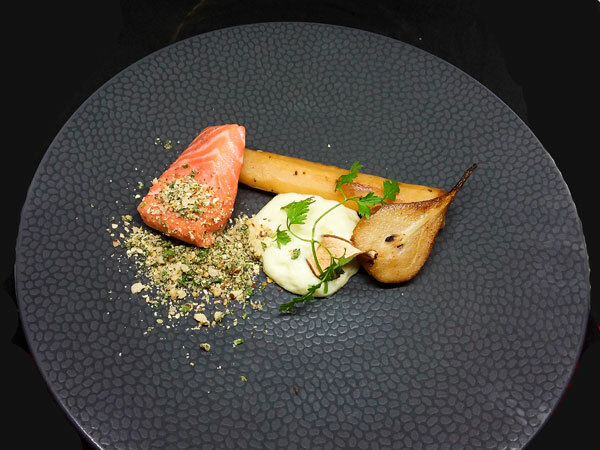 The mixture of textures, between the parsnip mousse with its sweet aroma, in counterpoint with the crunchy salsify and the pear exalts the fondant of the trout. 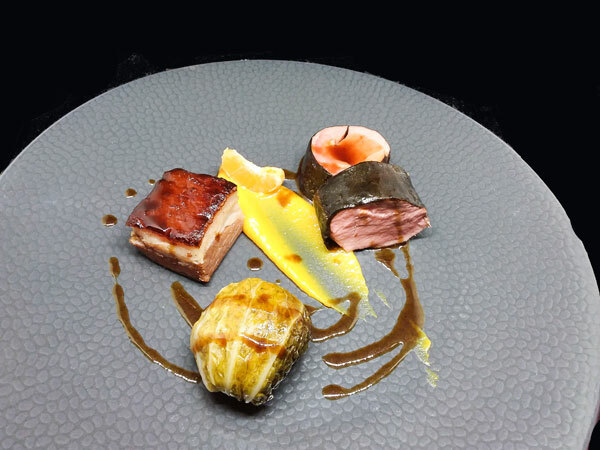 Plat: Slow Cooked Farm Pig Tenderloin, Clementine Condiment, Juice Lacquered Chest, Stuffed Little Cabbage. A superb declination of fine and tasty pig from the farms of our mountains. Our taste buds juggle between the tenderness of the pig cooked at low temperature, the melting chest and the cabbage stuffed with the fine texture spiced up by a full-bodied juice that gives the dish its full dimension. Dessert: The Praliné in all its forms. Covered with an appetizing milk chocolate, two praline cubes placed on a melting chocolate shortbread, are decorated with praline cream. The pretty quadrature was surmounted by a chocolate wheel reminiscent of the great workings of ski lifts of the station. 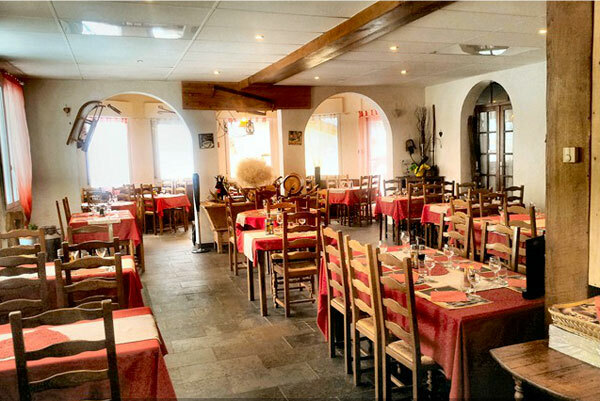 Located at the entrance to St Etienne de Tinée, the Hotel Restaurant Le Régalivou is a pleasant place with a dining room beautifully decorated in a mountain atmosphere. Chef Eric Grosso offers a gourmet and hearty cuisine of mountain specialties or pizzas and grilled meats, to enjoy in a warm atmosphere, as much on the terrace on sunny days or by the fireplace after a day of skiing. Also popular with hikers and bikers, the place is friendly and the prices fair. 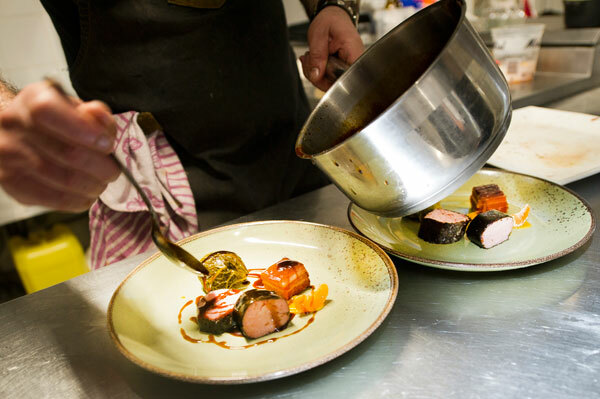 With the sumptuous pristine mountains of the Mercantour as a backdrop, the Chefs au Sommet d’Auron is a gastronomic event in Auron, Saint Etienne de Tinée and Saint Dalmas Le Salvage. 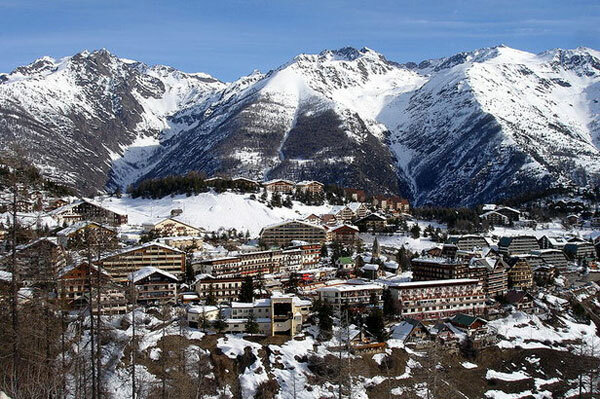 For eight years, the Mountain Gastronomy Festival has been offering gourmet meals at unique and affordable prices in the restaurants of the resort as well as numerous culinary activities. A team of talented chefs and pastry chefs from the Côte d’Azur offers an authentic moment of sharing culinary pleasures and conviviality with holidaymakers.